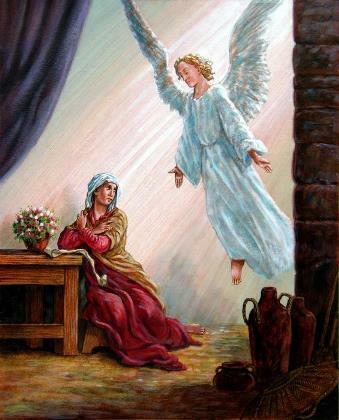 The angel Gabriel appeared unto an unsuspecting teenager named Mar y. He informed her she would be the vessel through whom God would fulfill His long-expected promise of bringing a Savior into the world. Stunned at heaven’s message to her, she was filled with bewilderment and trembling-wonder how this can be seeing she had never known a man. Yet she yields herself as a willing vessel, being told that the child being formed in her womb shall be called Emmanuel, meaning “God with us.” Was Mary delusional or was the angel right? Time would tell. Not long after Jesus’ birth Herod is found giving the command to have all male children two years of age and under slaughtered to make sure he eliminates this one who some were calling the King of the Jews. Mary and Joseph have to flee to Egypt for safety. If this Child is to be “God with us,” why such a travesty following His birth? Was the angel wrong? Could the angel have been wrong? Mary got her answer to that question three days later as an angel announced at the open tomb, “He is not here. He is risen.” Excited women and startled disciples were running around echoing the angel’s message, “He is risen.” The angel Gabriel had not been wrong, Mary had only misunderstood. The resurrection of her Son made it possible for Him to fulfill what the angel had originally promised Mary, “He shall be God with us.” His resurrection proved Christ was who the angel had promised; now alive for evermore it is possible for His presence to be with us in every situation and circumstance of our lives. Like Mary, we may ask, “If Jesus is ‘God with us’ why does He seem distant at times? Why does life seem at times harsh? Why does my heart still become broken by sorrow and heartache?” No, the angel was not wrong, but, like Mary, we have a misunderstanding about the message of Christmas. The Christmas story doesn’t mean there will be no more trials or problems, but because of Emmanuel, “God with us,” we have a new way to approach them. The Christmas story doesn’t mean we don’t still fail and sin, but because of Emmanuel, “God with us,” we can find in Him forgiveness for all our sins. The Christmas story doesn’t mean all our burdens are taken away, but because of Emmanuel, “God with us,” we are given an enabling strength to carry on. The Christmas story doesn’t mean we will not have sorrow, but because of Emmanuel, “God with us,” He is there to comfort us and see us through to brighter days. The Christmas story doesn’t mean loneliness will not sometimes visit us, but because of Emmanuel, “God with us,” we have the promise that He is always with us by our sides never leaving us alone. The Christmas story doesn’t mean the world has changed, but because of Emmanuel, “God with us,” we have changed. The Christmas story doesn’t mean our dreams and plans are not sometimes shattered, but because of Emmanuel, “God with us,” He gives us give new dreams, hopes and purposes that have eternal value. The Christmas story doesn’t mean that sickness, disease and death will not eventually come to us, but because of Emmanuel, “God with us,” we find He is the resurrection and the life and those who believe in Him shall inherit eternal life. The angel was right after all. The Christmas story means God in Christ is with us at all times. The Christmas story means it is possible to have a relationship with the promised Christ that is not subject to time, place or circumstances. Christmas means that we can say, “God with us” has birthed His presence into whatever circumstances and situations we go through. The angel was right, Emmanuel is with us. That being true, the Christmas story can be experienced every day, all the year through.